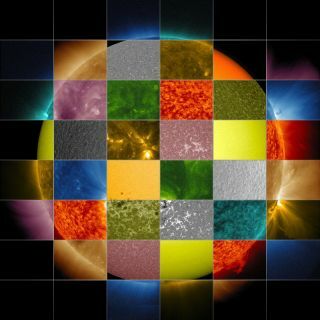 This collage of solar images from NASA's Solar Dynamics Observatory (SDO) shows how observations of the sun in different wavelengths helps highlight different aspects of the sun's surface and atmosphere. Though the sun appears yellow to the naked eye, it actually emits light in all colors, which scientists can see using specialized telescopes designed to observe wavelengths beyond the visible range. A more colorful collection of data reveals information about different parts of the constantly changing sun and tells scientists how solar material moves around the sun's atmosphere. There are two ways that solar telescopes can gather information from the light emitted by the sun. There are spectrometers that can simultaneously observe different wavelengths of light, generating graphs that give a composite picture of the temperature ranges in the material around the sun. Meanwhile, other instruments can take snapshots of the sun, capturing light in one particular wavelength that might not be visible to the naked eye. For example, the Atmospheric Imaging Assembly (AIA) instrument on NASA's powerful Solar Dynamics Observatory can observe light in 10 different wavelengths — each chosen to highlight a particular part of the sun's atmosphere. This image shows imagery both from the Advanced Imaging Assembly (AIA), which helps scientists observe how solar material moves around the sun's atmosphere, and the Helioseismic and Magnetic Imager (HMI), which focuses on the movement and magnetic properties of the sun's surface. NASA's Solar Dynamics Observatory is not the only spacecraft keeping a close eye on the sun. The Solar and Heliospheric Observatory, called SOHO, also monitors the sun under a joint mission by NASA and the European Space Agency. NASA's twin Stereo spacecraft record images of the sun from two vantage points in Earth's orbit (one ahead of the planet and the other behind) in order to generate 3-D views of the sun's weather.